SAMSUDIN, Ahmad and PULO, Lilian Baun and ABU BAKAR, Mohd Awis (2018) Indigenous voices in the land of the head-hunters: local content development of Sarawak’s Northern Region. Paper presented at: IFLA WLIC 2018 – Kuala Lumpur, Malaysia – Transform Libraries, Transform Societies in Session 153 - Poster Session. Sarawak State Library (Pustaka) aims to become a center of excellent in Sarawak collection. 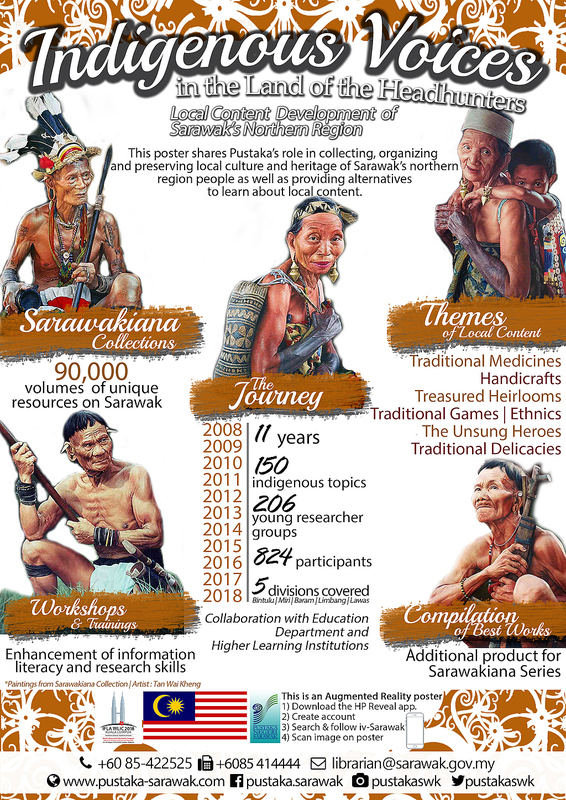 This paper shares Pustaka’s role in collecting, organizing, preserving local culture and heritage of the people in Sarawak’s northern region. Local Content means Sarawak’s heritage and cultures that show the identity of multi-ethnicity in Sarawak. They are the legacy practiced, inherited and passed down from one generation to the next. Pustaka took the initiative to organise annual competition to crowd source local content development need. More than 40 topics have been done and these contributed to knowledge creation for young generation. As part of this program, Pustaka’s train participants through Information Literacy Skills Program to produce students who are aware of the importance of information, understand the information requirement needed for learning progress and self-development. This initiative is hoped to be able to boost the power of creativity and innovation in young researchers when generating research work that is comprehensive, original and attractive. The collaborative efforts with the State education department, institutes of higher learning and teachers’ training centre ensured that the competition has the transparency and adjudged fairly. Participants, who are secondary students aged between 14 to 18 year old, undergo workshops organized by the library, particularly on how to write research, referencing and avoid plagiarism as well as how to make visual presentations. Pustaka achieves the target by harvesting a number of local content works which were written by the students and making it available at the library. Realizing the importance and value of all topics on local culture written by the students, Pustaka compiled the best researches done and produced it into a comprehensive book in collaboration with Universiti Malaysia Sarawak (UNIMAS). 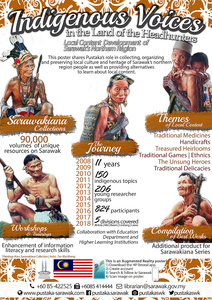 Pustaka has published a book called “A Compilation of Local Content in the Northern Region of Sarawak” (Kompilasi Warisan Budaya Tem-patan Wilayah Utara Sarawak). Some were even purchased by interested parties. Such initiative can be adopted by any library in the world which has the function of preserving local content or culture and heritage memories. It is one of the ways to encourage the community to appreciate, respect as well as help to preserve the cultures and at the same time utilize library materials for research. The implication for this initiative to the library and community is very important. Without exploring and recording the local content, the current and future generations will not know of their past and we will lose our culture. Pustaka will continue to be active in co-creating local content with the community or the library collection.